All Extruded: Master frame and inserts extruded aluminum. Durable enough to last the lifetime of your home. Fully Weatherstripped: Reduces infiltration of air, dust, rain, and noise to a minimum. Drop in Glazing: No glass to metal contact. Reduces possible breakage. Makes glazing much easier. Heavy Duty Metal Pivots: Provides continuous smooth operation of the operating insert. Resists breakage. Extruded Screen Frame: Insures tight fit of screen for insect control. Aluminum screen wire is impervious to insect attack. Dead Bolt Lock: Securely locks window so that it can only be opened from the inside. Zinc-plungers discourage forced entry into your home. Varying amounts of ventilation can be selected by several different opening positions of the operating insert. Tilt Type Inserts: Top, bottom, and screen inserts are easily cleaned both inside and out by lowering the insert and tilting it to the inside of the house. Inserts may also be removed simply by twisting them slightly to disengage the pivot from its track. Certified: These windows are tested and certified with Architectural Aluminum Manufacturers Association’s A.N.S.I. 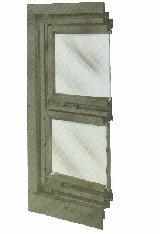 American National Standards Institute specification for storm windows.